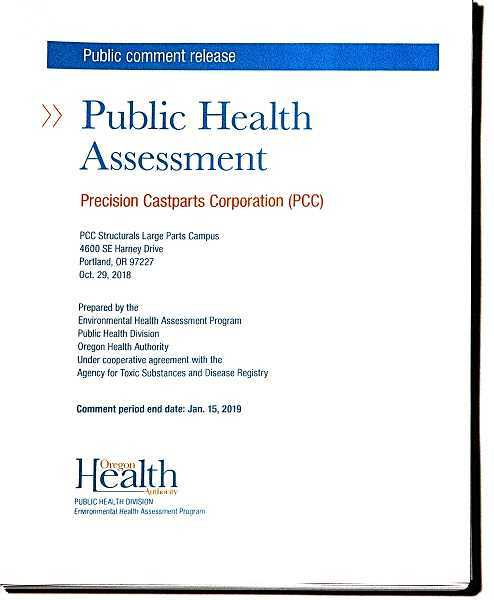 When the Oregon Health Authority (OHA) released its draft "Health Assessment" of the area surrounding the Precision Castparts Structural Large Parts Campus along Johnson Creek Boulevard, they held meetings in November and December to get feedback. As reported in the January issue of THE BEE, the OHA asked interested people who didn't attend the meetings to read, and then chime in, on this report. The facility, established six decades ago on S.E. Harney Road – and situated between the Brentwood-Darlington and Ardenwald-Johnson Creek neighborhoods – has been suspected by some neighbors in recent years of polluting the air and soil nearby, and Johnson Creek as well, with heavy metals. But, after scientific monitoring, the draft report found no evidence of that. The draft assessment found that measured concentrations of metals in the air and metals and other chemicals in soil and water near the metal components manufacturer's S.E. Harney Drive facility were below levels that would be expected to harm public health. Following up on the release of that Health Assessment draft report, OHA staff, joined by others from the Oregon Department of Environmental Quality (ODEQ), held several meetings in the area, the first of which was in the Lane Middle School library on November 29. Or they can be made via postal mail to – 800 N.E. Oregon St., Suite 640, Portland, OR 97232.